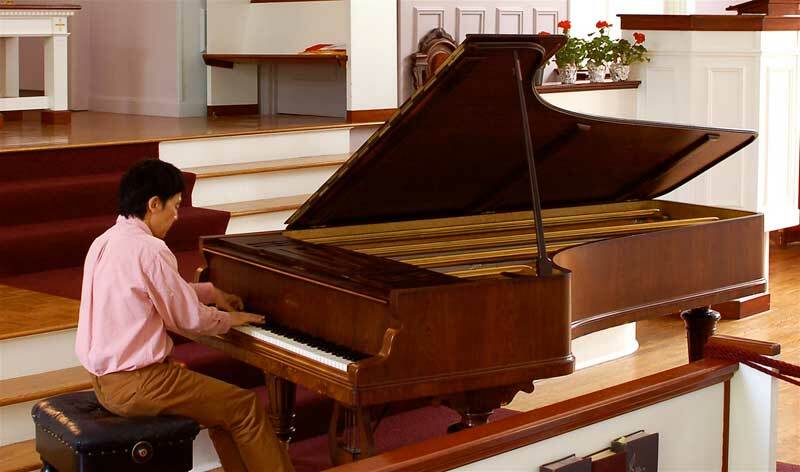 The 1877 Érard “Extra-grand modèle de concert” was in the sanctuary of the Community Church in Ashburnham, MA, again Sunday afternoon, May 23, for an all-French program played by Japan-born Manabu Takasawa, associate professor of music and co-director of Graduate Studies at the University of Rhode Island. It somehow seemed appropriate that the program for his début here opened with a prelude by Debussy, who was so famously keen on Japanese art; his “Poissons d’or,” the third of his second set of Images published in 1907 was actually inspired by a lacquer plaque that he owned, a photo of which adorns the cover of the booklet of Paul Jacobs’ recording thereof. The pair was separated by Fauré’s approximately 15-minute-long Thème et  Variations in c-sharp minor, Op. 73 (1895), a work in a more conventional classical form, whose theme is inspired by Schumann’s Études symphoniques (Op. 13, 1834-7, rev. 1852), and one that is rarely performed in recital. This allowed Takasawa to demonstrate more fully the piano’s broad spectrum of tonal variety and dynamic power. Fauré owned an Érard, so that the work sounded superb on this piano was no surprise. The first half closed with Ravel’s Valses nobles et sentimentales (1911), a set of eight waltzes with the final one bringing back material from the earlier ones, which further demonstrated the instrument’s enormous range and potential. The work is not entirely unrelated to his 1919-20 La Valse, whose solo piano version I can imagine in my mind’s ear as lush and ravishing as were these on this instrument, since Ravel owned an Érard and composed the works on it. The second half also opened with a Debussy prelude, the fanciful and ephemeral “Les sons et les parfums tournent dans l’air du soir” (Book I/4). Next up was a pair of shorter pieces by Fauré, Nocturne No. 4 in E-flat, Op. 36 (1884) and Impromptu No. 3 in A-flat, Op. 34 (1883). The performances were exquisite, perhaps more lovely than any I have ever heard, and the piano could not have suited the music more perfectly. Alas, though, Fauré’s piano music is not programmed anywhere often enough to suit me, so I have not heard them countless times. Someone should record all the Fauré Nocturnes and Impromptus on this Frederick Collection piano. Is Takasawa a candidate? The recital, masterfully played entirely from memory, concluded with César Franck’s monumental nearly 20-minute-long Prélude, Chorale et Fugue (1884), another work more classical in structure to match the Fauré piece in the first half — overtly inspired by J. S. Bach, and cyclical, like the Ravel in the first half, since it brings back at the end a lot of the earlier material. One could see in Takasawa’s facial expressions his increasingly relishing the recital as it progressed — the results he was able to obtain from the keys, with the intent seriousness of purpose changing to smiles of delight during the last two Fauré works followed by visible near ecstasy with the Franck. The splendid performance brought the audience to its feet nearly instantaneously. I also admired that Takasawa was able to do something that most musicians cannot: to control the audience’s seemingly uncontrollable urge to erupt into applause too frequently and too soon — a national malady — rather than to pause and to savor for a few instants first. He actually was able to play some of the related or deliberately contrasted works as uninterrupted pairs! Bravo! We hope he will make many future appearances on the Historical Piano Concerts series. Marvin J. Ward, a retired translator and teacher of French (Ph.D., UNC Chapel Hill), has been writing for Classical Voice of North Carolina, a professional journal, for a decade and was founding Executive Editor of Classical Voice of New England through December, 2009.